5 Runner Rally by In the Doghouse Designs measures--A: 10in x 34in B: 8in x 38in C: 6in x 34in D: 9in x 36in E 9in x 35in. 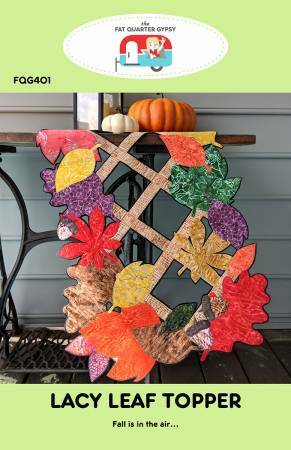 Autumn Table Runner designed by Jean Ann Wright for Cut Loose Press measures 26" x 42". 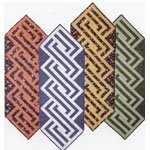 Aztec Diamond Table Runner by Krista Moser for Cut Loose Press measures 16.5" x 46.5". 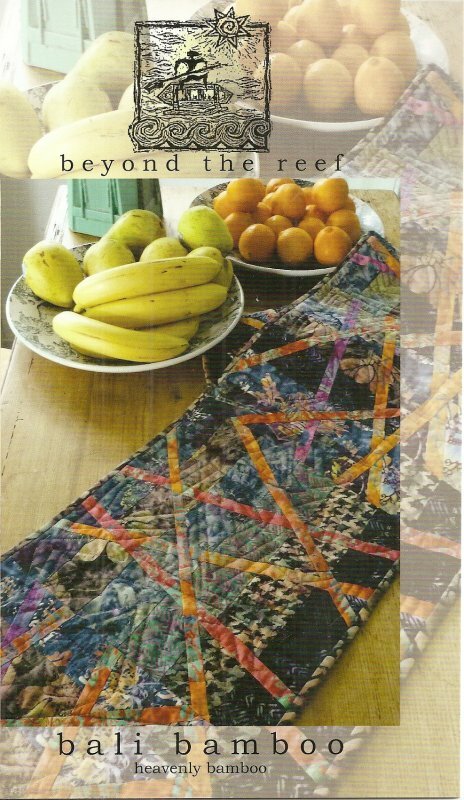 Bali Bamboo by beyond the reef is a pattern for a 12" x 72" table runner with additional sizes up to queen. Features Hoffman California Fabrics. Bayside by Sue Michaels for Dragonfly Fiberart is a table runner pattern that measures 21" x 45". Birds And Berries Runner by Jenelle Kent for Pieces to Treasure measures 15" x 48". 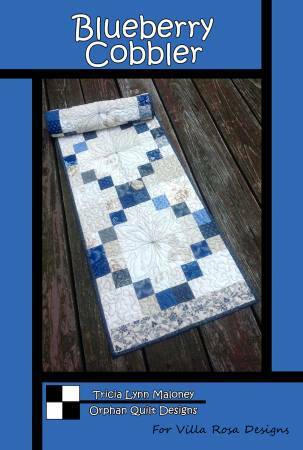 Blueberry Cobbler by Tricia Lynn Maloney of Orphan Quilt Designs for Villa Rosa Designs measures 16" x 52". 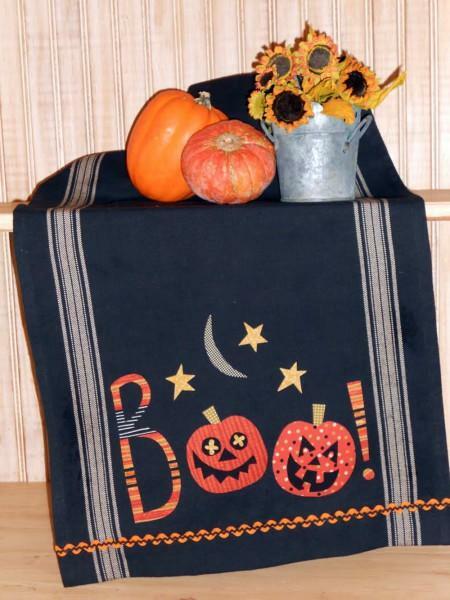 Boo Table Runner from Waltzing With Bears. Bracket Brigade by Sue Michaels for Dragonfly Fiberart is a table runner pattern that measures 18" x 42". Citrus and Berries Table Runner by Jean Ann Wright for Cut Loose Press measures 17" x 41". 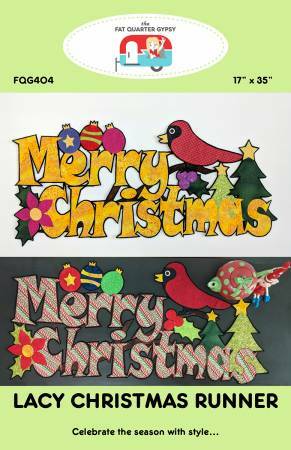 Crazy Christmas Trees designed by Karla Alexander for Cut Loose Press measures 16.5" x x43.5". 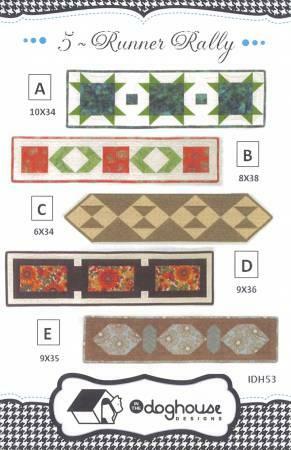 Cross Cross by Barbara Cherniwchan for Coach House Designs is a table runner measuring 18" x 54" and features the fabric line "Patchwork Garden" by Kathy Schmitz for Moda. 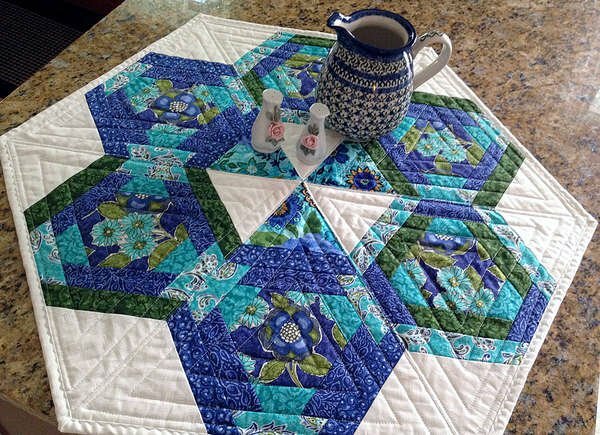 Crown Point Star by In the Doghouse Designs. Topper 16in x 16in Runner 14in x 38in. Curve Appeal by Tiger Lily Press should be called the fastest table runner in the West. 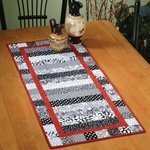 Perfect for large scale prints it makes a table runner measuring 15" x 42" and (4) place mats 14 x 18.5". 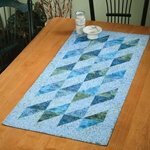 Dancing Diamonds Table Runner and quilt pattern from Tiger Lily Press. Dani's Garden by Barbara Cherniwchan for Coach House Designs measures 57" x 18" and features the fabric line "Paradiso" by Kate Spain for Moda. Diamond Head by Sue Michaels for Dragonfly Fiberart measures 17" x 42". 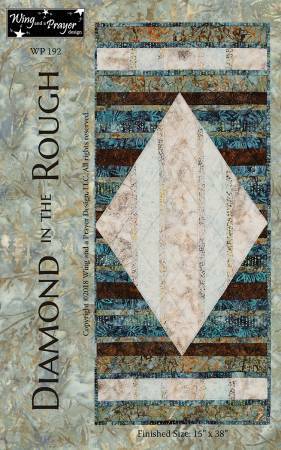 Diamond In The Rough from Wing and a Prayer Design measures 15" x 36". Diamonds Table Runner by Elsie M. Campbell for Cut Loose Press measures 17" x 51". 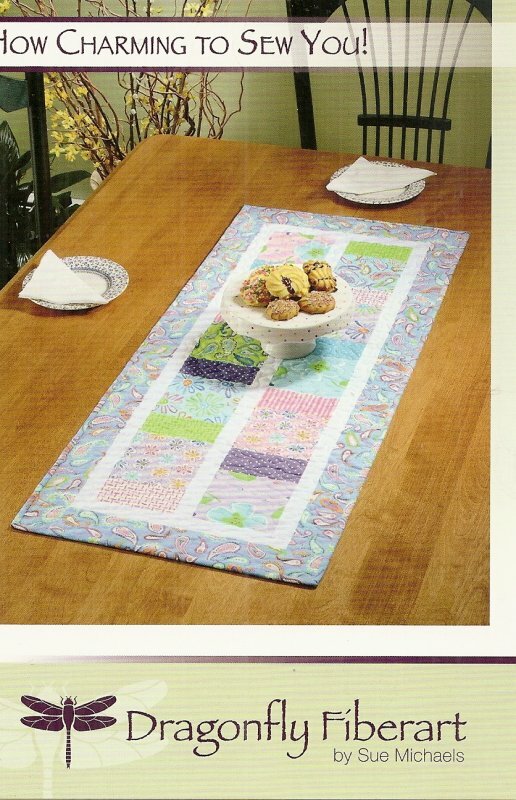 Drunkards Path Table Runner designed by Terry Atkinson for Cut Loose Press measures 15" x 40". 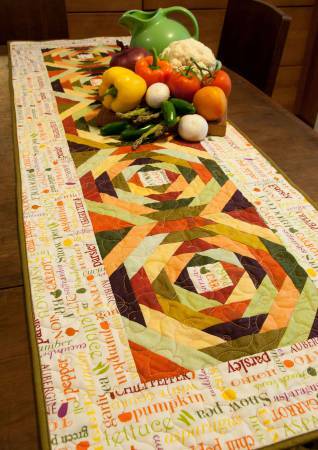 Eat Your Veggies Table Runner from Cut Loose Press measures 18" x 58". 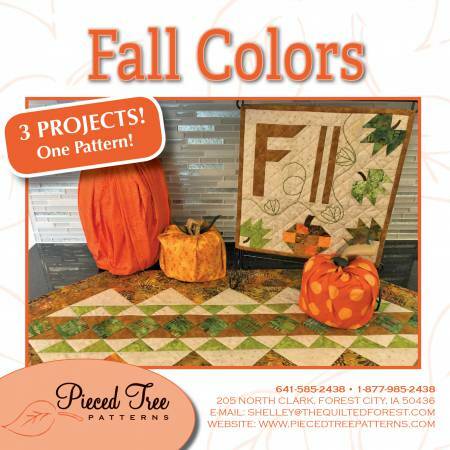 Fall Colors from Pieced Tree Patterns contains 3 patterns: Table Runner Mini Wall Hanging big and small fabric pumpkins. 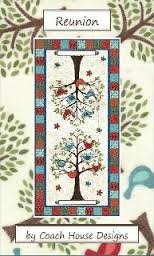 Farmhouse Window Table Runner by Judy Niemeyer and Judel Niemeyer Buls of Quiltworx is a pattern for a tablerunner measuring 19 " x 57"
'Fat 1/4 Favorite' is a pattern by Pieced Tree. It is fat quarter friendly and has 5 sizes included. Flower Ballet from Hummingbird Highway measures 18" x 55". Flower Power from Pieced Tree Patterns measures 20.5" x 38.5". 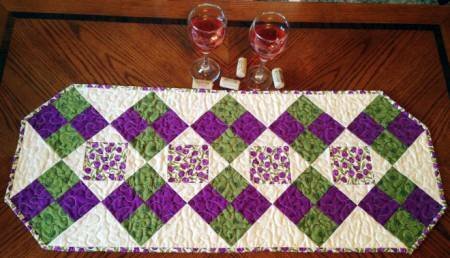 Uses one charm pack, and two other fabrics to make a great centerpiece runner! Fried Green Tomatoes by Jean Ann Wright for Cut Loose Press. 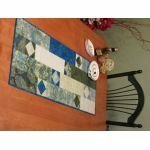 Placemats: 12" x 16". Tablerunner: 16" x 36". Uses Creative Grids 4" Curvy Log Cabin Trim Tool-CGRJAW6MINI. 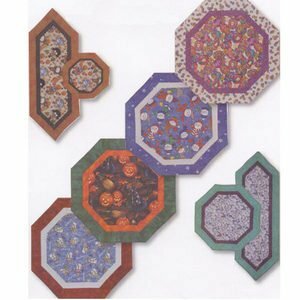 Fun four-Patch Table Runner 14" x 35 1/2"
Hexagons In Paradise Table Topper by Debby Kratovil for Cut Loose Press measures 24.5" x 28.5". 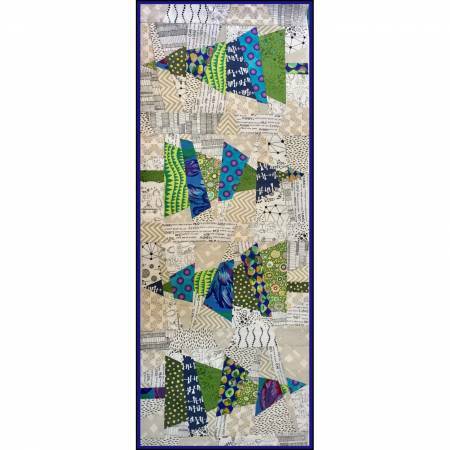 Holiday Lights Table Runner from Patch Abilities measures 12" x 40". 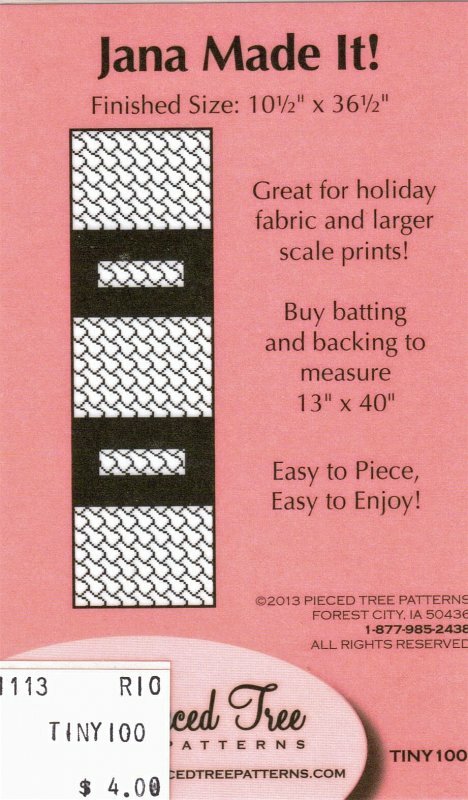 Hourglass from Pieced Tree patterns measures 7.25" x 71" to 13" x 77". Show off those perfect prints with this quick table runner! Directions for four different sizes! How Charming To Sew You! by Sue Michaels of Dragonfly Fiberart is a tablerunner pattern measuring 17" x 40". 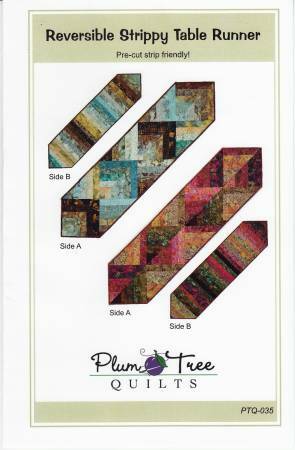 Jana Made It by Pieced Tree Patterns is a table runner measuring 10.5" x 36" that is great for holiday fabric and larger scale prints! 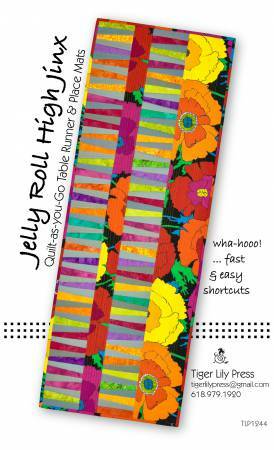 Jelly Roll High Jinx Quilt-As-you-Go Table Runner & Place Mats from Tiger Lily Press. 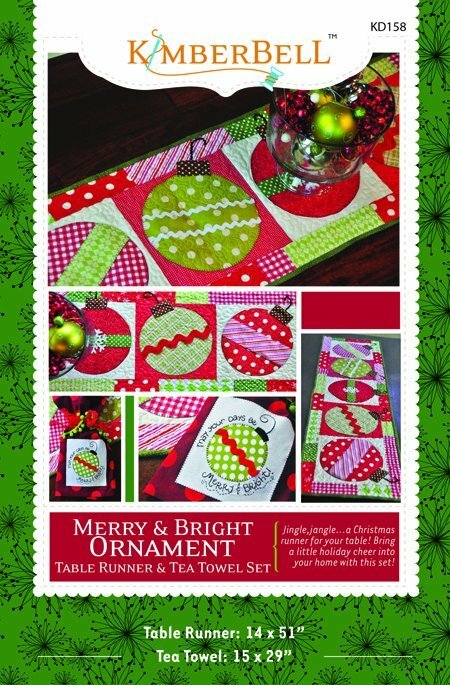 Lacy Christmas Runner from The Fat Quarter Gypsy measures 17" x 35". 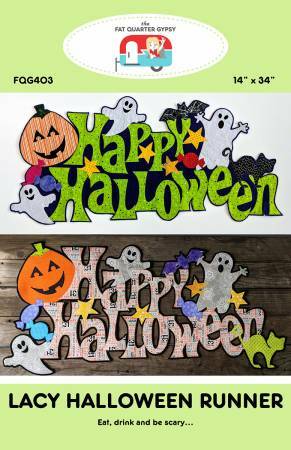 Lacy Halloween Runner from The Fat Quarter Gypsy measures 14" x 34". 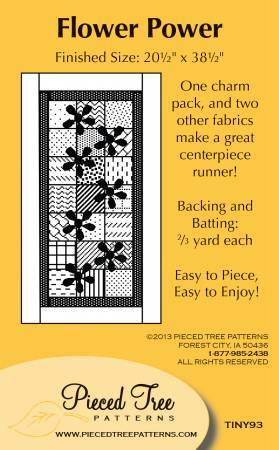 Lacy Leaf Runner from The Fat Quarter Gypsy in multiple sizes. Land of Liberty Table Runner by Cathey Laird for Cut Loose Press. 18in x 41in. Uses creative Grids CGR6. Project Time: 2-6 Hour. Fabric Type: Yardage Friendly. Project Type: Home. 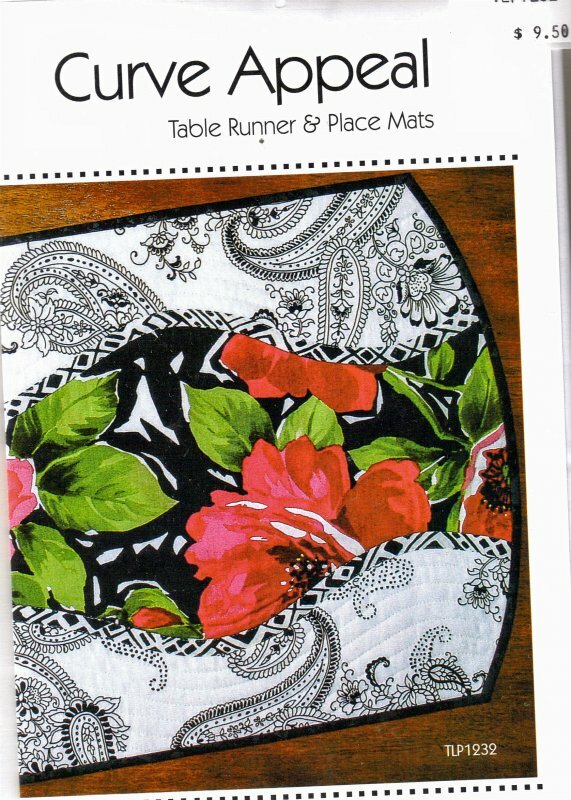 Le Poulet Runner & Placemats by Jenelle Kent for Pieces to Treasure. Runner measures 12" x 62". Placemat measures 12" x 15". Love Knot Table Runner by Cathey Laird for Cut Loose Press. 17in x 43in. Uses Creative Grids CGR8. Project Time -2 Hour. Fabric Type: Yardage Friendly. Monochromatic by Sue Michaels for Dragonfly Fiberart is a table runner that measures 17" x 40". 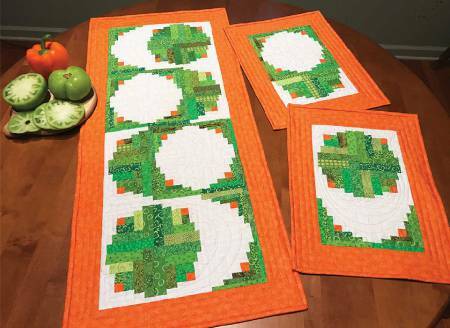 Orange Peel Table Runner by Terry Atkinson for Cut Loose Press measures 15-1/2in x 37-1/2in. Uses Creative Grids CGRATK1 and CGR812. Project Time: 2-6 Hour. Fabric Type: Square Friendly. Project Type: Home. Pickle Blooms Table Runner and Place Mats from Tiger Lily Press. Pointed Comments by Tammy Silvers for Tamarinis measures 20" x 40". 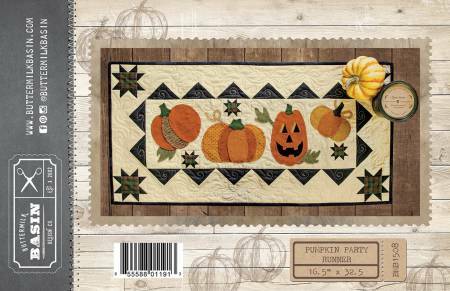 Pumpkin Harvest One Patch Runner by Carol Keller & Beth Rosene for Cut Loose Press measures 14" x 42". Pumpkin Party Runner from Buttermilk Basin Design Co. measures 16.5" x 32.5". 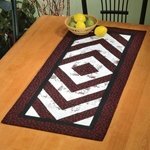 Quick and Easy Table Topper & Runner by Lehmann Quilting measures 18" for the table topper finished and 12" x 33" for the table runner finished. Reversible Strippy Table Runner from Plum Tree Quilts measures 16" x 64" and is pre-cut strip friendly! 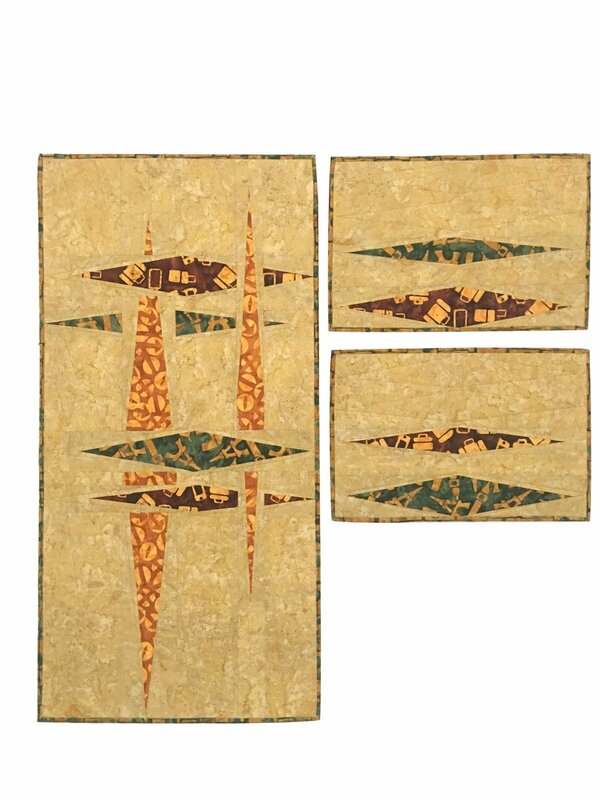 Rhapsodie Runner by Jenelle Kent for Pieces to Treasure measures 14" x 57". Roundabout from Cut Loose Press measures 17.5" x 50.5". 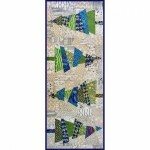 Scrap Stew by Camilla Quilts for Cut Loose Press measures 14.5" x 40". 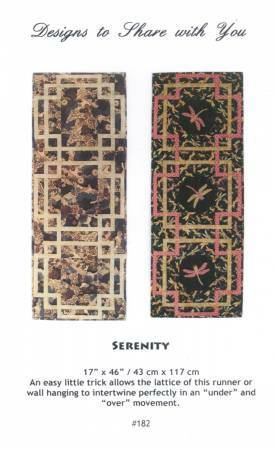 Serenity from Designs to Share with You measures 17" x 46". 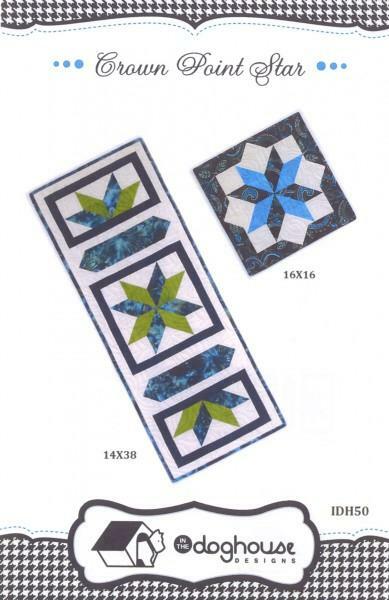 Skinny Bits by Debbie Went of Wendt Quilting. A "By The Numbers" pattern. A focus on skinny strips of fantastic fabrics. Choose it as a table runner or bed scarf. 20 1/2in x 60in. 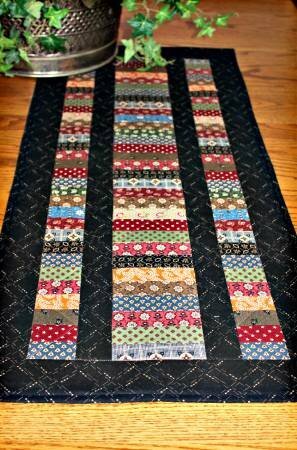 Double yardage for a lap quilt. 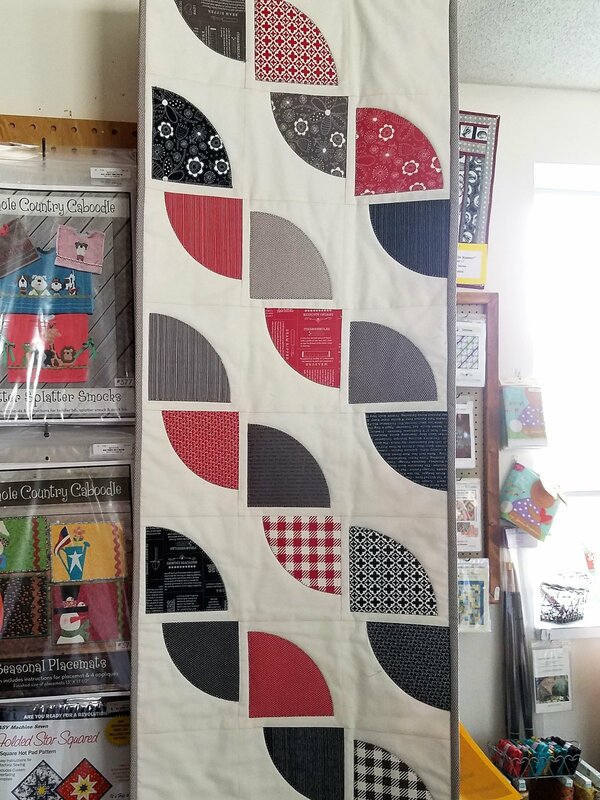 Snowbuddies from Coach House Designs measures 46" x 16". Cut Loose Pattern Spare Change Runner, 15 1/2" x 36 1/2"
Stained Glass Tulips by Kris Holderness for Cut Loose Press measures 17" x 31".